Outside My Window… the bright sun blies the cold temperatures and high winds that have settled on Toronto these past few days. I am thinking… about what it would be like to be a converso….to be told to either leave a country or convert to another faith. I am thankful for… the opportunity to sing some of the most magnificent music ever written. From the kitchen... I need to do a grocery run and figure out what to cook this week (not necessarily in that order). I am wearing… a white blouse, pale violet cotten v-next sweater, grey trousers, black socks and shoes. I am creating… some christmas gifts that must remain a secret for the time being! I am going…to throw in a load of laundry so we don’t have no-clean-school-shirts panic again tomorrow morning. I am reading… Doors Open by Ian Rankin. I am hoping… that Wilson did well with his dental scaling and possible tooth extraction. I am hearing… the clock ticking. It is unnaturally silent in the house with Wilson at the vet. Around the house… the carpets are all in desperate need of the vacuum. One of my favorite things... is sugared nuts. In ice cream. In salads. With popcorn. All by themselves. A Few Plans For The Rest Of The Week: I am planning to head down to Queen’s Park tomorrow for the Remembrance Day service. I may drp into the ROM afterwards to see Marie-Antoinette’s dress. I want to get some Christmas shopping done so that I can take gifts with me to Ottawa in a couple of weeks. 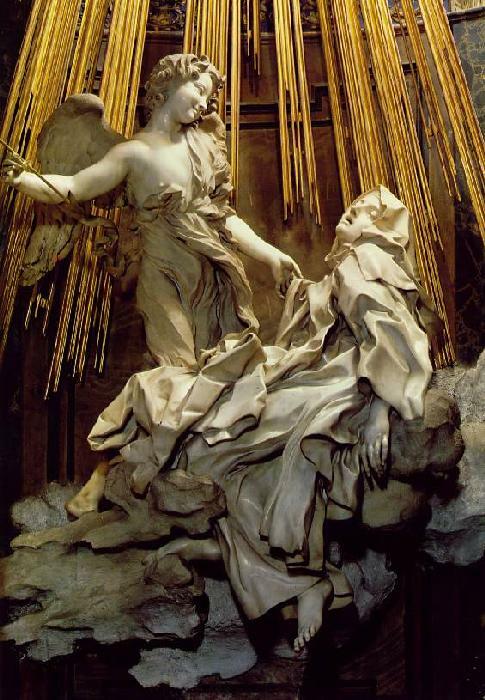 The Ecstasy of St. Teresa, by Bernini. Based on the spiritual autobiography of St. Teresa of Avila. Meme from The Simple Woman’s Daybook.